Two of the three leading teams, Mercedes and Red Bull head and tail the field in terms of wheelbase for their 2019 cars. The German-Anglo team has the longest wheelbase while the energy drink company-owned team has the shortest car. Thirty years ago, teams were much more open with the information they shared about their cars. After they launched their cars, they usually shared data on its dimensions – overall height, width, length, wheelbase. They used to be less secretive when it came to these parameters, nowadays, the picture has completely changed, and each outfit will only share the information it is forced to. Despite all the secrecy, teams can measure almost all the important information by the time they get to the first race of the season. With the right images, team are able to find out the dimensions of their rival cars. As soon as the cars hit the track for the first time during the winter testing, teams send the photographers to different points of the race track. For the dimensions like length, width, and static rake, the photographers usually take images at the pit entrance where the cars are traveling at a slower speed. As the wheel diameter is a known constant, engineers can easily calculate the key dimensions. As far as the width is concerned, each car has a width of 2m as the regulations state. The minimum weight of the cars is 743kg including the drivers and their equipment. As confirmed by Mercedes, the Championship winning team has stuck to its philosophy regarding the wheelbase of their car. As has been the case for many years, the W10 is the longest car of all with a wheelbase of 3698mm. That is 79mm longer than Red Bull’s RB15 which is the shortest car in the field. Ferrari’s SF90 sits between zhe two with its wheelbase of 3653mm. Interestingly, Toro Rosso, the junior team of Red Bull adopts a largely different wheelbase compared to the parent company. 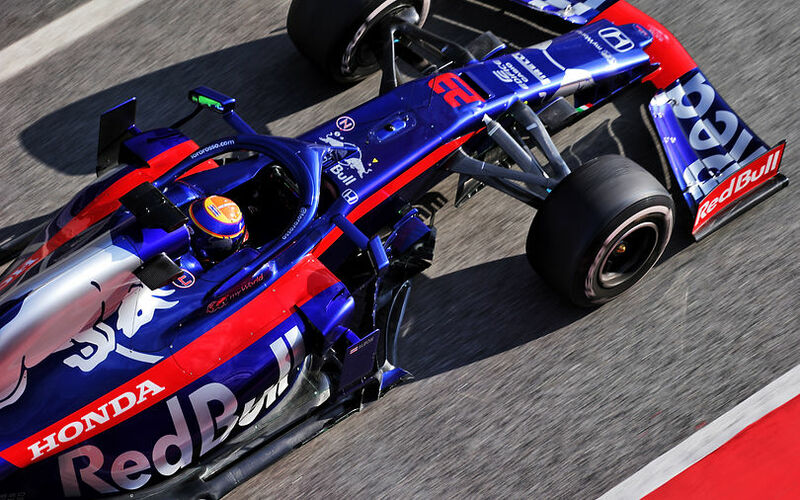 The Faenza-based squad has been working in close alliance with Red Bull, sharing parts with each other, but the wheelbase of 3693mm of the STR14 is much longer than the one of the RB15. The cars also differ in their aerodynamic philosophies, with Red Bull opting for a more conventional front wing, while the Toro Rosso uses the Ferrari style out-wash wing. Haas caused a similar surprise. The American team has been working closely with Ferrari since it joined the sport. Their alliance usually prompts some of their rivals to accuse the Günther Steiner-led outfit of breaking the sporting rules by taking too many parts from Ferrari, but the wheelbase is very different between the two squads, with a difference of 32mm. Some years ago, Red Bull’s chief designer Adrian Newey brought a design masterpiece back into the sport. In 2009, the FIA introduced a set of new regulations affecting the aerodynamics of the cars. One of the modifcations enabled engineers to place the front wing closer to the ground than it had been possible before. Capitalizing on that, Newey designed his team’s 2009 car with a high rake, raising the tail of the car to lower the front wing and exploit more downforce due to the front wing's ground effect. The rake was such that is could easily be spotted with the naked eye. Many teams have adopted that philosophy since, and Red Bull is not the team with the biggest rake angle in the 2019 season. AMuS estimate Renault stands out with its 2.15 degree of angle which has been evident since Daniel Ricciardo and Nico Hülkenberg brought the Enstone-based team’s R.S. 19 on to the track during pre-season testing at Barcelona. As a result, the Renault front wing was frequently scraping the ground. 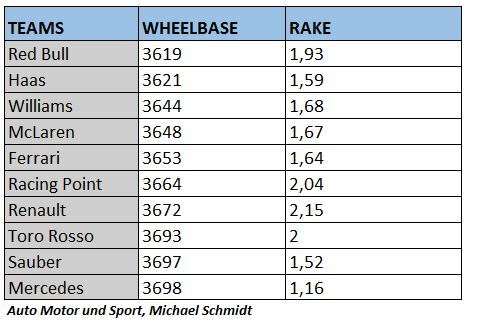 Red Bull now only occupies the fourth place on this list, with its RB15 featuring a rake angle of 1.93 degrees. As to the long wheelbase, Mercedes sticks to its low rake concept with its W10. The Anglo-German team’s car only features a 1.16 degrees of rake which can be easily seen when watching the car on track. The big rival Ferrari again sit in between their two main competitors, Mercedes and Red Bull, the SF90 has a 1.64 degree of rake.